Groupe Rock 'n' Roll US, the Moonriders comprenaient Hickey, Lees, Macomber, Peters, Siegfried et Sylvia. Ils ont enregistré chez Artcom Records de Park Ridge (Illinois). 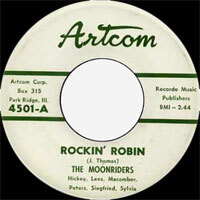 US Rock 'n' Roll group, the Moonriders included Hickey, Lees, Macomber, Peters, Siegfried and Sylvia. They recorded at Artcom Records of Park Ridge (Illinois).